Forget everything you think you know about clay masks. Charlotte’s fabulous new formula will leave you moisturized, dewy, and glowing whilst also tightening your pores and clearing imperfections. This supercharged Goddess Skin Clay Mask is based on an ancient Mediterranean beauty recipe, which combines gentle yet nutrient-rich Spanish clay with Sweet Almond Oil, prized for its nourishing properties Charlotte has fused this with. Working with the world’s leading laboratories, Charlotte took this centuries-old remedy and added the latest anti-age breakthrough ingredients, such as the BioNymph Peptide Complex to create a glow-giving formula your complexion will drink in. 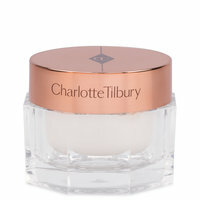 Try it using Charlotte's patented Tilbury Tap Pro-Collagen facial massage for boosted results. Celebrity facialists have been sharing the formula with their clients to use in between treatments leading up to a red carpet appearance. 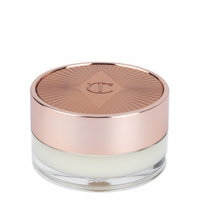 Now everyone can have flawless, glowing Goddess Skin - discover the rebirth of your skin, the results are breathtaking. This is a wonderful mask but the price is a little ridiculous. The ingredients aren't amazingly beneficial for what the cost is. Basically, the two ingredients that make this mask effective are the kaolin clay and the sweet almond oil. Both items can be purchased from health stores or even online. I buy my clay from soap aria online. Its only $15 for a good sized pot of dry clay and add almond oil and sometimes glycerine which are about $5 for each for a very generous size. I get the exact same results. I mix it into a pretty jar every two weeks or so for a fresh mask with no preservatives or fragrance. 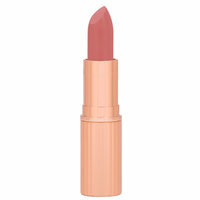 The best product in Charlotte's whole collection!!! 70.00 is a lot of money to spend for a face mask and it might be hard to justify when face masks are a dime a dozen. So let me just put it to you this way...after using this mask one time I boxed up the 9 other (expensive) face masks I had in my bathroom and let me friends have every last one of them. This is hands down the best face mask I have ever used. I could see a difference in my skin immediately after rinsing it off. My skin was glowing, my pores looked visibly clearer, the texture of my skin was soft and plump and any dry patchiness has been sloughed off. I use this mask every week and people always comment on how bright and clear my skin looks after I use it. And your skin literally feels like baby skin!!! I can't see myself ever buying another face mask again. I will just replenish this one when it runs out. If you don't like strong floral smells, then test this first; it is extremely fragrant. I love this so much. It leaves your skin plump and clear. I use this regularly as a nightly mask before bed. My skin is combo and sensitive and it works great. 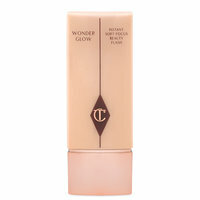 I even use it as a spot treatment and find it is not as drying as with other treatments which I really like. Like the Magic Cream, this is unfortunately a very spendy product. And also like the Magic Cream, I've unfortunately come to the conclusion that I may not be able to be without this mask once this tube runs out. If you're on the fence about this product, I highly recommend giving it a go. True to its description, you really must throw out everything you think you know about a clay mask when you use Charlotte's product. Unlike other clay masks, this one does not entirely dry down on the face after application; it also does not make the skin feel tight in that sucked-dry way some clay masks can (I'm looking at you, GlamGlow and Clinique... *cringe*). Going on, Charlotte's mask has an incredibly fine, lotiony-clay feel to it. It's not heavy and it doesn't pull on the skin as it applies. As for rinsing, I recommend following the package directions -- because the technique suggested there honest-to-goodness works like a charm. After removal, the skin is left visibly softer, firmer (in the right way, not dried out! ); any redness you had will be reduced, and skin is left feeling beautifully nourished, calmed, perfectly balanced and hydrated. Somehow, it leaves you looking more soft-focused. Baby skin: that's the best way I can put it. I like to use it at night, a few times/ week, after washing off my makeup (but before the rest of my crazy regimen). In the morning, my skin still looks stunning and is easier to work with, in terms of makeup application. Best. Mask. Ever. Literally the best mask I have ever tried! My skin felt so soft and gorgeous after just one use! The smell is to die for, but if you're not a big fan of florals or fragrances, test it first. My skin is combination, with a tendency to break out on my T-Zone, and this helped clear me up almost instantly! I can feel my pores opening up every time I use it. Such a gem! I gave this a shot recently and was NOT disappointed! First off, it smells fantastic without being heavy. It wears light as silk, and doesn't dry with the same texture of your classic mud mask. It actually dries much more softly, with much less pulling at the skin and general tightness. My skin is TOUGH -- I give it the rough stuff: full-on bentonite clay masks and the like. This is NOTHING like that. Feels so light, almost like you don't have product on. 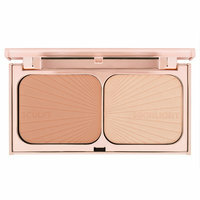 Applies very evenly and smooths to completely cover the face. I find this made the most difference on my lips (which tend to air on the side of dry) and my nose/forehead area (which actually airs on the OILY side) and that really blew me away because it made me feel like this is a suitable option for any skin type, be it oily, dry or anywhere in between! Washes off super easy, leaves your skin feeling.... fuller? It's like a straight shot of hydrating cleansing awesomeness! My skin took my moisturizer like a dream, and the next day I noticed the high points of my face looked SO smooth! Like, MODEL GLOW with no makeup on. I've only bought one other mask in my life and it was years ago. I decided to treat myself to this one after reading the glowing reviews. Also, with a name like "Goddess Skin Clay Mask", it has to be good, right? Well, it is. I apply it 10 minutes before getting into the shower and massage it in before rinsing. I have been using this ever other day because I am addicted to the baby-smoothness it gives my skin. I know I should cut down... maybe next week! ..I've never gotten so many compliments after using this.. I put mask on and it was like a fairy waved her magic beauty wand after I went out and about with the lasting, glowing after affects of mask..
LOVE this mask! I love using it before a big day ahead of me, because it makes my skin just glow and be radiant with or without the makeup! This does the trick every time!I always get compliments on my skin when I use this mask. Its not as thick as a lot of other clay masks tend to be, but you don't need to use a lot for application. And its a quick 10 minute mask, which is great if you're in a hurry! 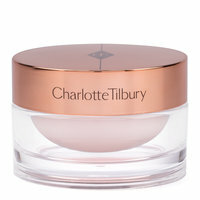 I love Charlotte Tilbury's makeup, and she doesn't disappoint with her skincare either.